There are two players: a defender and a challenger. At the first level, the challenger’s options are to adhere to the status quo, or to challenge the defender. Faced with a challenge, the defender can choose defender capitulates (left), defend (middle), or escalate (right). 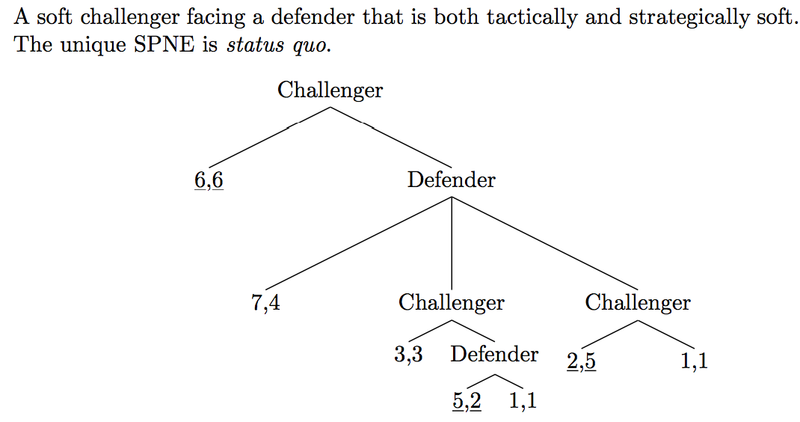 At the second level, if the defender had escalated (right subgame), the challenger can choose war or defender wins. 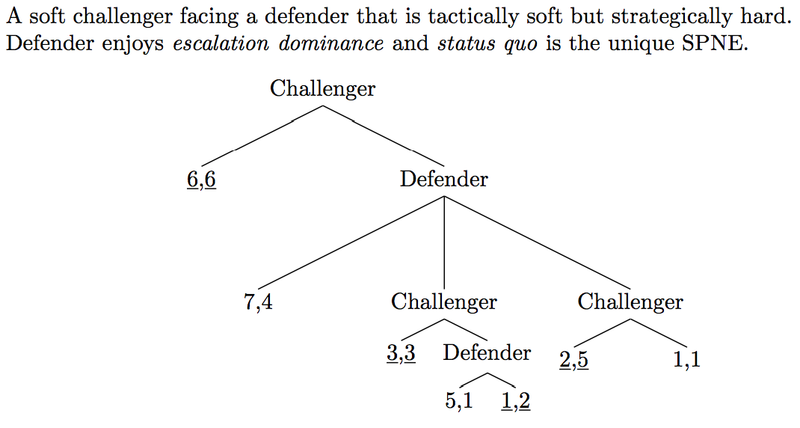 If the defender had chosen defend (middle subgame), the challenger can choose to fight a limited conflict (left), or escalate (right). In the latter case, the defender can choose war or challenger wins. We call a challenger ‘hard’ if she prefers war to defender wins, and ‘soft’ otherwise. We call a defender ‘tactically hard’ if he prefers limited conflict to defender capitulates, and ‘tactically soft’ otherwise. 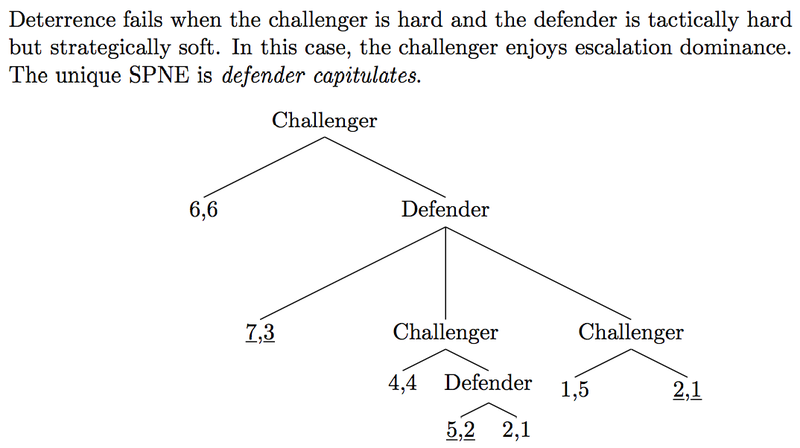 Lastly, we call a defender ‘strategically hard’ if he prefers war to challenger wins. Thus, we have eight possibilities (S or H for challenger, and HH, HS, SH, SS for defender) under complete information. Clearly, extended deterrence cannot hold when a hard challenger faces a defender of type SS. 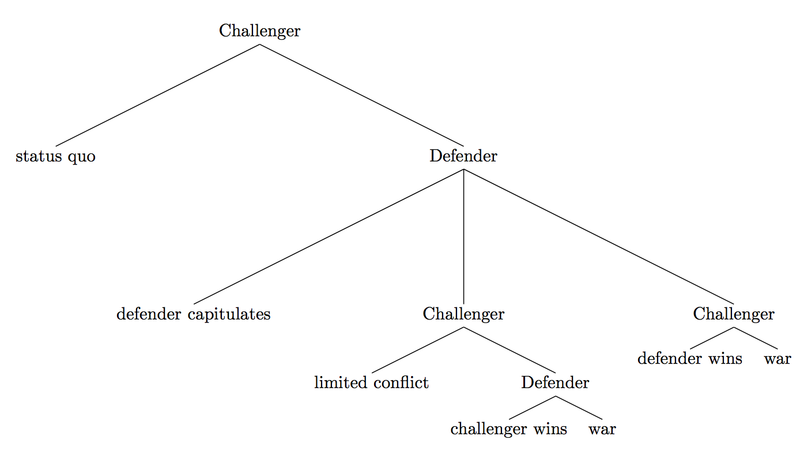 Note that, in all asymmetric escalation games under complete information – the players’ type is common knowledge – the SPNE is either status quo or defender capitulates. This is simply because, since the players know each others’ type, threats are either completely credible or incredible. As we will see, this is not the case when players are uncertain about the other’s type. 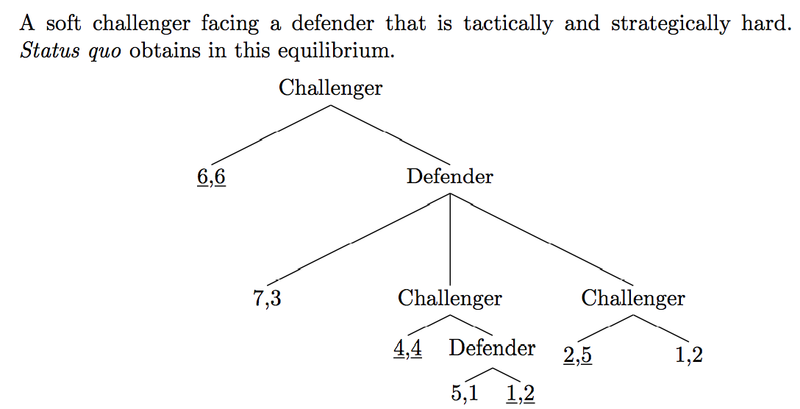 A Perfect Bayesian Equilibrium (PBE) specifies the probability that a challenger of a given type will initially challenge the defender ( x ), the probability that a defender will defend ( y ) and escalate ( z ) in response, and the challenger’s updated probability that the defender is strategically hard given that it turned out to be tactically hard p(Str|Tac), and its response by type ( w ). A PBE is not only a Nash equilibrium (no one can do any better by changing their strategy unilaterally). The strategies also have to be credible: restrictions to any subgame involve rational play. Lastly, the probability p(Str|Tac) is calculated using Bayes’ rule. We shall henceforth assume that the challenger is likely hard since this is the only interesting subset of configurations. The analysis of the PBEs highly technical and the reader is advised to consult the book for a detailed computation. We shall instead present the results qualitatively by looking at the conditions under which different families of PBEs obtain. There are four possibilities for equilibrium play: status quo, defender capitulates, limited conflict, and war. The status quo is very likely when the defender has a high probability of being both strategically hard and tactically hard, that is, of type HH. Suppose the challenger knows that the defender is unlikely to be of type HH. In such a configuration, a challenger of either type will defect from the status quo. If the defender is of type SS, he backs off and the game ends with defender capitulates. Otherwise, the defender responds (D) with certainty if he is tactically hard (HH or HS), and probabilistically if he is tactically soft (SH). This comes as a surprise to the challenger who was expecting capitulation. At this point, a soft challenger has to accept a punishing limited conflict. For the hard challenger, it is more complicated. At this node, she needs to update her beliefs about the defender’s type. If the updated probability p(Str|Tac) is large, then the hard challenger will accept a limited conflict. However, if p(Str|Tac) is sufficiently small, that is, if the challenger thinks that the defender is much likelier to be of type HS than HH, then the challenger will escalate with positive probability. If the defender is strategically soft (of type HS), then he concedes and the game again ends at limited conflict. However, if the defender is strategically hard (of type HH), he escalates, and the game ends with war. This last equilibrium is the only path to war describing conditions under which deterrence breaks down completely. The unthinkable only happens when a truly determined defender is unable to convince an equally determined challenger that he intends to resist every step of the way. On the other hand, for extended deterrence to succeed, the defender must convince the challenger both that it is prepared to endure a strategic conflict and respond at the tactical level. 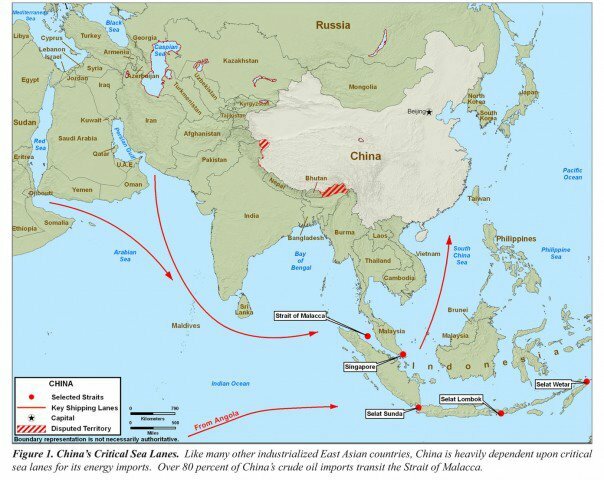 Coming to the Taiwan dilemma, it is clear that one should not regard war as nuclear war but rather a globe-spanning conflict whereby both powers attack each other’s forces all over the world, and at the same time being deterred from launching a strategic first-strike on the adversary’s homeland. Intra-war deterrence is likely to obtain, otherwise no power can be regarded as ‘strategically hard’. At present, China is soft, and the US is both strategically and tactically hard. Thus, extended deterrence is likely to hold. As China grows stronger, this equilibrium will become more and more precarious. At some point, China is become stronger than the US, at least near its center of power in northeast Asia. It will then try to forcibly absorb Taiwan (and kick the US out of the Korean peninsula). The US might be strategically hard (preferring a major war to relinquishing its command of the global commons), but tactically soft. The US would then enjoy escalation dominance, forcing China to back off with a credible threat of escalation. For instance, the US might increase its military presence in the Korean peninsula and threaten to impose a naval blockade. It is also likely that China would calculate that the US is unwilling to risk an AirSea battle over Taiwan to maintain its autonomy. In effect, that the US is of type SH or SS. In a political crisis over Taiwan, China may then be tempted to absorb Taiwan. If the US turns out the unwilling to fight even a regional conflict, Taiwan would be absorbed. On the other hand, if the US unexpectedly put up a fight, China will have to decide whether it wants to escalate or fight a limited AirSea battle in the Taiwan strait. It is quite unlikely to escalate to a globe-spanning war, because it would be fairly confident that the US would fight tooth and nail to maintain its global power position. China could fail at any level. If the US won the AirSea battle over the Taiwan straits, China would emerge considerably worse off than before. It would be even worse off if it initiated a major war to kick the US out of Asia and lost. In that event, it would not be able to mount another challenge for very many decades.